Esmeralda Yitamben is a distinguished postdoctoral fellow at the Center for Nanoscale Materials. She is originally from Cameroon, in Central Africa and came to the United States for higher education. She received her Ph.D. in physics and nanotechnology from the University of Washington in Seattle under the guidance of Marjorie Olmstead. 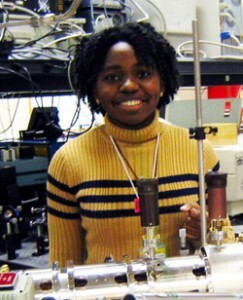 She has been at Argonne as a postdoctoral fellow since September 2010. Yitamben works in the Electronic and Magnetic Materials Division, under the supervision of Nathan Guisinger. Her research focuses on the study of molecular dynamics of individual molecules absorbed on metallic surfaces. She is also interested in the transmission of chirality from single molecules to complete surface layers using scanning tunneling microscopy and spectroscopy, as well as the study of low-dimensional carbon based nanostructures such as graphene. Yitamben is an active member in Argonne’s community. She currently is the treasurer of the African American Black Club (AABC). She enjoys sharing ideas with members of the club and is happy Argonne encourages diversity and promotes cross-cultural awareness. “Science is just as diverse as people,” says Yitamben. Yitamben recently attended a Mentoring Conference at the University of New Mexico, Albuquerque. The focus of the conference was helping institutions develop and mature their own mentoring programs. A range of support was offered from best mentoring practices to new ways to implement positive mentoring programs to improving existing programs. Mentoring has had a strong influence on Yitamben’s life. It has helped her to stay grounded and focused. Even though she has achieved a great deal professionally, she is humble and credits the mentors in her life for her achievements. “Truly, it does take a village to raise a child. I am the reflection of all the mentors in my life,” says Yitamben. While Yitamben has been a mentee, she also believes in mentoring and guiding others as well. She has mentored a wide range of individuals from peers and colleges to high school students and those with special needs. She also mentors young girls who aspire to be scientists. She encourages them in their pursuits. “I want to encourage and make sure there are other young girls and minorities joining the sciences,” says Yitamben. This entry was posted in Postdoc Spotlight and tagged esmeralda yitamben, postdoc spotlight. Bookmark the permalink.